You might know her as Mo Finney, rarely seen without her two jolly golden retrievers, and you probably thought she was Irish but the woman with the smiling eyes was named Monique Liette Bailly at birth. Her mom had gotten hold of a French baby name book to reflect their French-Canadian heritage, and then, Mo married an Irishman. Mo feels that her life has had plenty of great adventures. 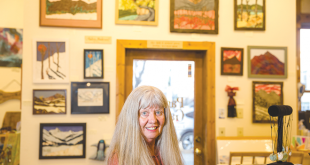 She grew up between Livingston and Bozeman, Montana, skiing at Bridger Bowl from the time she was four. Influenced and encouraged by a mom who was an avid skier, Mo skied as much as possible during the winter and rode horses in the summer. Her horseback riding, like Mo herself, was free and wild. Her mother is still riding at 70, chasing cows around and hiking and skiing. “She’s the one who taught me that you can do anything in life. She gave me all my courage,” Mo says with admiration. “Dad was the one who made me braver than I am smart,” she laughs. “High school sucked, I hated school. I struggled through,” she says, and as soon as she graduated in 1989, Mo hit the slopes, becoming a lift operator at Bridger. In the summer, she headed to Big Sky, starting out as a waitress but ending up as a lift coolie. “It’s basically a grunt. You’re the bottom of the barrel, the nail, not the hammer,” she recalls of the hierarchy. While Mo was digging holes, her first labor job, she had met some guys who were part of the team building one of the new lifts. They were studying ski area management in college in Washington. Mo had always had an interest in the ski industry and after taking that gap year, applied at Wenatchee Valley Community College, dead-center in the state of Washington. The girl who never thrived in school graduated in the top of her class in 1993 with an AAS degree in ski management. “Plus, I had to pay for it and get grants, so that gives you that little extra boost.” Along with her love for the industry, it was the impetus to succeed. 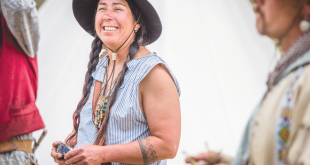 Mo saddled up her little Chevy S10 truck with a topper and a mattress in the back, picked up a traveling companion in Bend, Oregon—her first puppy, Sheria—and set out to explore. “Because I didn’t have a clue as to where I was going, I had just left school and drove away. I felt that it was a good time to get a puppy because I had no responsibilities, and I devoted all my time to her, my copilot, Sheria. The following winter of 1993-94, Mo was driving a cat at Jackson Hole. 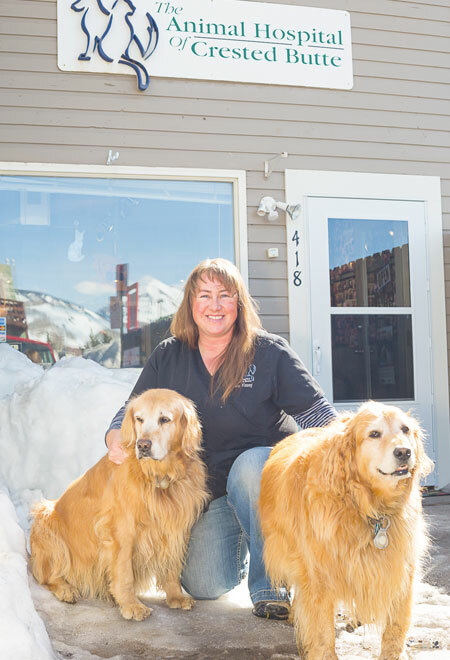 College had taught her various applications and jobs in the ski industry like snowcat driving, ski patrol, lift maintenance, mechanical maintenance, and every aspect of ski area management. Mo jokes that she majored in cat driving, “But the truth is, I liked cat driving over ski patrolling because throwing bombs is fun but then you have to go move all that snow. 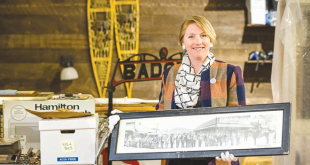 Jackson wasn’t that friendly to out-of-towners, like newbie employees,” she feels, and says most of the cat drivers were ranchers or farmers who drove farm equipment but had no clue as to the ski culture. So much awesomeness that Mo and Sheria lived in the parking lot out of her truck until she found a place to live. She and one other girl were the first two women to ever drive cats there that year. After one epic season, Mo and her copilot drove south. She had been to Crested Butte in her brief visit to Gunnison and knew she liked it and the people. She ended up in Crested Butte and never left. In the summers, Mo did remodeling carpentry, but hated it. “I’m not a carpenter, I’m a mechanic,” she realized. She was hired to operate equipment by All Weather Earthworks, a dirt construction company out of Gunnison who put her in a dozer for two summers. She helped fill the Columbine gully at the CBMR base area, working 12 to 14 hours a day, seven days a week because they had to get it done before the area opened. Mo was part of the team that helped to put in the roads and infrastructure in at Pitchfork up on the mountain. When the Muellers bought CBMR in 2004, she was hired the following summer for the crew that put in roads and infrastructure at the Prospect subdivision. When that wrapped up she went to work for Corbin Marr, who used to build houses here. She worked on the Prospect house for him for two years, until the market crashed in 2008. Mo was still a cat operator for CBMR during the winter, but having to do only graveyard shifts, instead of rotating in different shifts, was too hard so she moved on from foreman, although she still grooms. That spring, when faced with going back to the bottom of the food chain and digging ditches, Mo started branching out her opportunities. “I’ve always been a major animal lover so I wanted to do something with animals,” Mo determined, so she looked into grooming, “Grooming to grooming,” she laughs. Mo discovered that no one really wanted to give her a shot at an office-type job. “I got really, really lucky when Dr. Laura Ramos had an opening at the front desk at the Animal Hospital of Crested Butte and she offered me a chance,” Mo says. That was the summer of 2010. Mo notes, “Laura had been my vet since 1997. It was awesome, it was such a wonderful change. It was funny because I knew all of the husbands and boyfriends of the wives and children and pets that were coming in,” since she had worked at the same construction sites. Mo started out as the receptionist, working full-time in the summer, part-time into the winter. In 2011, she worked the front desk full-time as manager, dog wrangler, cat roper, running triage, and loving every minute of it. “Dr. Laura taught me everything I know about veterinarian medicine. She’s such a wonderful person and vet and I’m truly grateful that she gave me this opportunity. It’s also great to work with Dr. Leonard—they both make my job awesome. I am now a technician, a doggie-kitty nurse holder of your loved ones. I assist with surgeries and all aspects of keeping the place running. The people and pets that come in make it wonderful. Mo met Darin Finney, her Irishman, in 1997 upstairs at the Talk of the Town in the middle of the day. They’ve been together ever since, tying the knot on September 1, 2001. “He’s the carpenter, I’m the mechanic. That’s our life,” she smiles. But, Mo grins that Elkie loves to fish, chasing salmon and trout up- and down-stream for hours on end. “Elkie is my soul mate and muse and I got her as a puppy in 2006 and Gidget in 2011. We got Elkie her own pet,” she laughs about Gidget, who belongs more to Elkie. Their family includes three cats: “Two Dots, for the two spots on her head, Vixen, who is truly a vixen, and Sneaks, because she sneaks up and wraps herself around your legs. She’s the talker in our family,” Mo describes the other fuzz faces of their clan.